Agronautas is a multidisciplinary project investigating initiatives, processes, designs or ways of life that reformulate relations between people and the natural environment. To start the exploration, in 2011 and 2012 interviews were carried out on 56 people from different areas and groups and representatives of 40 initiatives from Asturias, the Basque Country, the Community of Madrid, Castile and Leon and Catalonia. This documentary is but a fragment of some of these conversations. Documentary on the participation of women in the Alarde parades of Irun and Hondarriba and the feelings and controversy triggered by that participation. The festivities lasting all day in both towns serve as the background for the story. The first part explains the Alarde since it first started, its history, its mise-en-scene, its composition and its characteristics. The second narrates the beginning of the conflict and how it developed in the early years, in the 90s. A third part talks about 2011 and 2012, reflecting on the present situation of the celebration and its future. The tale is told through different characters from both towns who narrate their experiences, their feelings and their thoughts. In the past 40 years, the so-called "War on Drugs" has cost the United States over a billion dollars. America is the world's largest jailer, with 25% of all prisoners worldwide (in a country with only 5% of the world population). The black population accounts for 13% of all inhabitants and 14% of drug consumers, yet 37% of those arrested on drug accusations and 56% of those incarcerated for drug-related crimes are black. This is a war fought on home ground, which has in recent decades seen 45 million arrests and cost countless lives, destroying families and inflicting untold damage on future generations of Americans. The veteran filmmaker from Salamanca –Nine Letters to Bertha (1966), Dearest Executioners (1973), La seducción del caos (1991), Octavia (2002)– has decided on this occasion to adopt a new style, impressionist and similar to other pure documentary endeavours, allowing the images to explain themselves, with no comments, on-camera interviews or voice-over explanations whatsoever. 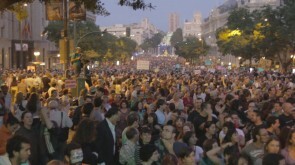 The film starts with the gathering of demonstrators in Madrid's Puerta del Sol, portraying their arrival to the beat of the Brazilian samba bands and popular songs as they chant the slogans that will become the stamp of the movement. It then proceeds to follow the construction of the Sol Camp, a sort of parallel city, with its own organisation and where meetings on the situation are the norm, tasks are distributed democratically, each person contributes their knowledge and work and participates in any way they can. Germany, 1945. The war is over. A group of children make their way through the devastated country to reunite with their grandmother, 900 km away in the north. Lore, the eldest, is left to care for her four siblings when her Nazi parents are taken prisoner by the allied troops. Together the four set out on a journey that will show them the reality and the consequences of their parents' actions. But when they meet the mysterious and charming Thomas, a young Jewish refugee, Lore's world fills with contradictory feelings. Siblings Lourdes and Mentxu Arrieta understand one another with a look. And the expression is particularly pertinent in this case: unable to control their body movements due to motor disorder, the two communicate by writing letters in the air with their eyes. They've been communicating like that for 30 years: thanks to their eyes, in silence, in a manner that seems never to have existed before. But there's more. They are convinced that the "Arrieta method" –as they themselves christened it– could be very useful for a vast numbers of people in the world and offer them enormous communication possibilities. That's why they want it to be known on all five continents... So that it can change many lives. Radmilo and Mirko form a young gay couple who would be completely happy anywhere else in the world... except in Serbia. They try to live discreetly, but every day they receive abuse from the homophobic majority. This year, Mirko wants to organise a "gay pride parade", even if it is pretty much a mission impossible: in 2001 an attempt to do so ended in bloodshed. Today the situation has changed little – nationalist and neo-Nazi organisations threaten to perpetrate another massacre if the parade goes ahead. All seems lost until their chance meeting with Lemon, a local gangster, and his fiancée, Pearl. Misha Brankov is a retired music professor. One morning he receives a letter asking him to contact the Jewish Historical Museum in Belgrade. There he is told that while excavating the sewerage system of the old fairground, a metal box was found in the exact spot where there was previously a concentration camp for Jews and Serbian Gypsies during WWII. The contents of the box will change his life. After a storm, Jafaar, a Palestinian fisherman from Gaza finds a pig in his net. The animal has more than likely fallen from a ship. Determined to rid himself of the impure beast, he decides to sell it and ease his desperate financial situation. To find a buyer, Jafaar sets out on a mad and not particularly recommendable adventure. In this tragicomedy, the little town of Gaza, trapped between its everyday misery, the coercion of the Israeli soldiers and the scrutiny of the Islamic fundamentalists, is represented by a poor fisherman who ties to scrape a living and will do (almost) anything to get by.